The term heather is frequently used to describe both heather and the plant heath, but, although they are very similar, they are not the same plant. While both are in the Ericaceae family, heather is in the Calluna genus with a full Latin name of Calluna vulgaris, while heath is of the genus, Erica. Both heather and heath are evergreens, branching shrubs with white, purple or mauve flowers. Depending on the cultivar chosen, these shrubs are anywhere from a few inches to three feet tall and create an oval mound or mat. The primary difference between the two is that heath is less cold-hardy and its leaves are shaped like needles, compared to the heater's scale-like leaves. The leaves on the heather are approximately 1/8" long and can change colors throughout the seasons. The small flowers are formed into long racemes and appear from summer to fall. Heather is a relatively low maintenance plant, growing happily in both full sun and part shade, and able to thrive in poor, acid, sandy soils. 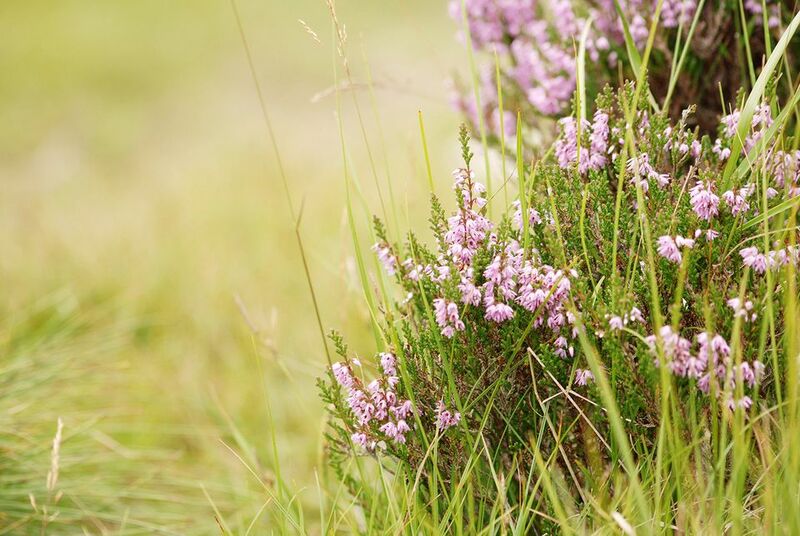 Heather is frequently called by the names Heather, Scotch heather, ling, or Scottish heather. The larger heathers are particularly striking when planted in mass on a slope. The smaller cultivars are frequently used in rock gardens, as a ground cover, or in borders, depending on the variety. A common complement to heather is dwarf conifers. The general range for many heathers is Zones 4 to 6, although several varieties can grow in Zones 3 to 10. Read the information for the cultivar you choose to be sure it will thrive in your area and make it through the winter. Heather (and heath) like more acid soil, preferring a pH of 4.5 to 5.5, so work in some acid amendments if your soil tends to be alkaline. This plant also requires good drainage and will struggle in clay, so either chooses a different location or amend the soil with organic matter to improve water flow. Plant heather in a location that receives full sun to part shade. Fertilize with an acid-based fertilizer such as that used for rhododendrons. Plant your heather at a spacing that will allow it to mature to full size without being too cramped, but be sure to plant it tightly enough that it will form a single mound if you are planting multiple plants and that is your goal. Keep it well watered its first year, after which it will be somewhat drought-tolerant. Heather needs very little fertilizer if any. In fact, it will thrive in poor soil, so after the initial fertilizer at planting time, just leave it alone. Prune annually, either in the winter after blooming, or in the spring before buds have appeared. Prune lightly, just below the spent blooms. Propagation is done through seeds, cuttings, and layering. Powdery mildew and root and stem rot can attack heather, especially if the drainage is poor. Pests that can attack heather include spider mites and oyster shell scale.